When you have too much of prolactin in your blood, you can develop hyperprolactinemia. Prolactin is a hormone produced by the pituitary gland, an organ the size of a pencil eraser at the base of the brain. The hormone plays a crucial role in breast development during pregnancy and breast milk production. 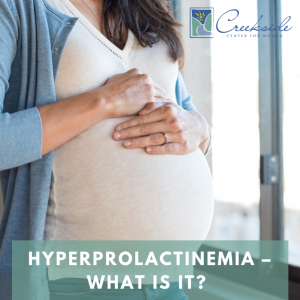 While hyperprolactinemia is considered normal during pregnancy and breastfeeding, disease, tumors, and certain medications can also cause it. If you have menstrual irregularities, vaginal dryness, and/or breast pain, these may be the first clues that you have a medical condition that needs attention. Prolactin levels may be high for several reasons. One of the more common cause is a tumor on the pituitary gland called a prolactinoma. The tumor, which is typically benign, could cause headaches and/or vision problems. To diagnose hyperprolactinemia, your doctor will check prolactin levels with a blood test. Normal prolactin levels are less than 500 mIU/L for women. Your doctor may order an MRO that looks for any growths on the pituitary gland. Some medications can reduce prolactin levels and shrink pituitary tumors. Surgery may be used to remove a pituitary tumor, especially if your vision is affected. Radiation is rarely used but may be necessary to shrink the tumor. Substitute medications may be prescribed if the cause is prescription medications. A synthetic thyroid hormone may be used if hypothyroidism is the cause. If you’re experiencing any of the symptoms described, contact Creekside Center for Women at (479) 582-9268 to set up an appointment with our experienced medical providers.